Godsmack is an American rock band from Lawrence, Massachusetts, formed in 1995. The band is composed of founder, frontman and songwriter Sully Erna, guitarist Tony Rombola, bassist Robbie Merrill, and drummer Shannon Larkin. Since its formation, Godsmack which has resulted in six studio albums, one EP (The Other Side), four DVDs, one compilation album (Good Times, Bad Times... Ten Years of Godsmack), and one live album (Live and Inspired). Since its inception, Godsmack has toured on Ozzfest on more than one occasion, and has toured with many other large tours and festivals, including supporting its albums with its own arena tours. Godsmack has sold over 20 million records in just over a decade. In honor of the band's success and the release of their sixth studio album, 1000hp, Mayor Marty Walsh has declared August 6 as "Godsmack Day" in the city of Boston. In February 1995, Sully Erna decided to start a new band as the lead singer after playing the drums for more than 23 years, including more than two years in the now-defunct band Strip Mind. His new band, The Scam, formed with Erna on vocals, Robbie Merrill on bass, local guitarist and friend Lee Richards on guitar, and Tommy Stewart on drums. The Scam quickly changed its name to Godsmack, after recording one demo. The newly formed band started playing small bars in their hometown of Boston. Locally popular songs such as "Keep Away" and "Whatever" soon brought them to the top of the hit charts in the Boston/New England area. The band's name, according to Erna statement in a 1999 interview, "I was making fun of somebody who had a cold sore on his lip and the next day I had one myself and somebody said, It looks like God smacked your face for making fun. The name stuck and they went by Godsmack from then on. We were aware of the Alice in Chains song but didn't really think much about it." In 1996, Tony Rombola and Joe D'Arco joined Godsmack as the guitarist and drummer, after Richards left upon learning he had a six-year-old child and Stewart left due to personal differences. In the same year, the band entered the studio for the first time, recording its first CD titled All Wound Up. The CD was recorded in just three days for $2,600. For the next two years, the band played throughout the Boston area. Eventually Godsmack's CD landed in the hands of Rocko, the night-time DJ for Boston radio station WAAF (FM). The radio station put "Keep Away" into heavy rotation and the song rose to the number one spot at the station very quickly. Newbury Comics, a New England record store chain, agreed to sell the CD on consignment. Shortly after the success of "Keep Away", Godsmack went back into the studio and recorded a single titled "Whatever", which became the new local favorite on WAAF (FM). 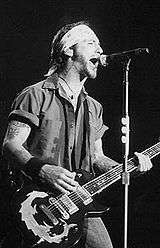 In an interview Sully Erna stated, "We had been selling maybe 50 copies a month at the time WAAF picked up the album. All of a sudden we started moving over a thousand records a week. (...) I was doing all this from my bedroom. After years of grinding away, things finally started taking off". In mid-1998, Universal/Republic Records signed the band to their label. Joe D'Arco was dismissed from the band. He was replaced by former drummer Tommy Stewart, who returned after expressing a desire to be in the band again. The band's first studio recording All Wound Up was re-mastered, and the finished self-titled debut CD album Godsmack was released to the public six weeks later. 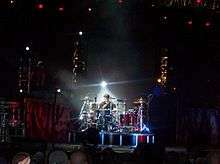 This led to the band's first headlining tour, "The Godsmack Tour" with Jim Rose Circus as the opening act. After the album's release the band went on the street playing club shows as well as playing at Ozzfest and Woodstock '99. This was followed by a tour in Europe supporting Black Sabbath. Roxanne Blanford from Allmusic gave the album three out of five stars, stating, "Godsmack confidently brought metal into the technological age". The album entered the Billboard 200 at number twenty-two, and was certified 4x platinum by the RIAA in 2001 after being initially certified gold in 1999. The album sold well despite being initially pulled from the shelves in some stores due to concerns over some of its lyrical content. The band and its record label later added a Parental Advisory sticker to the album, and some stores ordered amended copies of the album. Erna commented in Rolling Stone magazine stating, "Our record has been in the marketplace for more than a year now without a parental advisory sticker and this is the one and only complaint ... Stickers and lyrics are by nature subjective ... We have decided to put a sticker on the record". This controversy did not appear to adversely affect album sales but, according to Erna, helped, "It's almost taunting kids to go out and get the record to see what we're saying on it". The album also had four successful singles which were "Whatever", "Keep Away", "Voodoo" and "Bad Religion". "Awake" was featured on U.S. Navy commercials up until 2007, when it was switched to "Sick of Life." In 2000, Godsmack returned to the studio after the multi-platinum success of Godsmack to start recording Awake. The album was released on October 31, 2000. The album debuted at number five on the Billboard 200, and has been certified 2x platinum by the RIAA. "Vampires", a song on the album, also earned the band a Grammy nomination for Best Rock Instrumental Performance in 2002. With the release of Awake, Godsmack toured Europe supporting Limp Bizkit. Erna said at the time, "We've been touring nonstop since August 1998, So most of Awake was written on tour while we were ping-ponging between America and Europe, building up the band. "Ozzfest" was actually the only big tour where we rode under someone else's wings; we did a lot of work on our own." The band played Ozzfest in 2000 again as they had in 1999. Two of the songs on the album were used in United States Navy commercials ("Sick of Life" and "Awake") as background music. Erna stated, "Someone in the military is a fan, and they asked if they could use the music, and we accepted". However, Erna insisted in an interview that Godsmack does not support any war. In 2002, Erna was asked to write and perform a song for the soundtrack to The Scorpion King. The motion picture was the third in the Mummy saga, and was a spin-off prequel of the Mummy series. The song Godsmack wrote and performed was titled "I Stand Alone" and the song became the number 1 single at Rock Radio and the most played Active Rock song in 2002 for 14 weeks straight. It was also used in the game Prince of Persia: Warrior Within. With Shannon Larkin (ex Ugly Kid Joe, Souls at Zero, Wrathchild America, MF Pitbulls) replacing Tommy Stewart, who left due to personal differences for the second time, Godsmack went back into the studio to record a new album that was released in 2003. Faceless debuted at number one on the Billboard 200, selling 269,000 copies in its first week, and the album would go on to sell over one million copies in the United States. Faceless managed to beat West Coast nu metal band Linkin Park, with the release of their second studio album Meteora, which dropped to number two on the Billboard 200. Faceless also debuted at number nine on the Top Canadian Albums and at number one on the Top Internet Albums and remained at that position for two weeks. A massive Tour of America and Europe supporting Metallica followed. The lead single "Straight Out of Line" received a Grammy Award nomination for "Best Hard Rock Performance". The award went to Evanescence's single "Bring Me to Life". The album got its name after a swimming-pool incident. However, in a later interview Merrill stated otherwise, making it unclear of how the album's title came to be, "It came from the band's feeling that, despite our radio and sales success, we still flew a bit under the radar". On March 16, 2004 The Other Side, an acoustic EP, was released. The album debuted at number five on the Billboard 200; this is a relatively high position for an acoustic EP. It included several previously released songs re-recorded as acoustic versions, as well as three new acoustic tracks. One new song, "Touché", featured Godsmack's first guitar player, Lee Richards, as well as John Kosco, who were at that time in the now defunct band Dropbox, The other two new acoustic tracks were "Running Blind" and "Voices". The song "Asleep" is actually an acoustic version of "Awake" from the band's second album Awake. Godsmack shifted from its "heavy" sound to a more mellow acoustic sound on this EP in the same manner Alice in Chains did in the Sap and Jar of Flies EPs, one of many similarities to Alice in Chains for which the band has been criticized. In 2004, Godsmack opened for Metallica's "Madly in Anger with the World tour", and headlined the tour along with Dropbox. Afterwards, in autumn 2004, the band played several acoustic shows to promote The Other Side, while at the same time continuing to open for Metallica. "Speak" was the first released single from the album IV. On April 25, 2006, Godsmack released its fourth studio album simply titled IV, followed by a tour that would continue until August 2007, titled "The IV tour". The album was produced by Erna and engineered by the well known producer and engineer Andy Johns, known for engineering Led Zeppelin's Led Zeppelin IV. The first single from the album, "Speak" was released on February 14, 2006. The album debuted at number one on the Billboard 200, selling 211,000 copies in its first week. IV has since been certified gold. The band had written over forty songs for the album, but the final track listing had eleven tracks, Larkin commented, "it's Sully's band and his vision.[... ]When it comes time to pick the songs it's all Sully". The album's minimalist name "IV" derives not only from its being the band's fourth studio album, but also from a running piece of backstage humor, as related by Larkin and Erna in an interview. To celebrate ten years as a band, Godsmack released a greatest hits album entitled Good Times, Bad Times... Ten Years of Godsmack on December 4, 2007. The album debuted at number thirty-five on the Billboard 200, selling 40,000 copies in the first week of release. It includes a cover of the Led Zeppelin song "Good Times Bad Times", as well as a DVD of Godsmack's acoustic performance in Las Vegas at House of Blues. The album was originally intended to be a boxed set, but the band scrapped the plans so they could release a best of album. Godsmack will follow the release of the album with an acoustic tour. Despite rumors of the band going on hiatus as a result of releasing a greatest hits album, Erna was quoted as saying, "we're not going away, we are just gonna take a break and enjoy our 10th year anniversary and kind of recharge our batteries. And then Godsmack will be back, and we will come back bigger and badder than ever." In November 2008, Larkin announced that the band would be reforming and recording a new album. The following summer, the band toured as support to Mötley Crüe's Crüe Fest 2 tour and released a non-album single, "Whiskey Hangover". After the tour, Godsmack started production for their new album. The album, titled The Oracle was released on May 4, 2010. Arriving to popular reception, The Oracle is Godsmack's third straight full-length studio album to debut at No. 1 with 117,000 sold in the first week of release. Erna had this to say about the early sound album, "It's gonna be really heavy. I mean, it's very aggressive. I'm not really sure; it's very premature right now. Right now we just finished one track for the Crüe Fest this Summer. But as far as the whole record goes, I think it's going to be a lot more in your face. I don't think there's going to be any 'Voodoo's or 'Serenity's on this one. We decided to go balls out!". Godsmack headlined the fourth annual Mayhem Festival alongside Disturbed. The band entered the studio in January 2012 to mix a live album plus record several covers for an upcoming release. The band then went on tour in the spring with Staind. Godsmack has completed work on an EP of cover songs. Godsmack released their new live album Live & Inspired on May 15, 2012. The set included a bonus EP of cover tracks. In January 2013, Erna announced a short solo tour through America. In February, Sully said in an interview that Godsmack would take a break during 2013. "We are going to take some time away now because we just ran for two years" he said in an interview with Loudwire. In February 2014, Erna tweeted that the band has made progress in the songwriting process for its next studio album, tentatively scheduled for late 2014 release. He also mentioned that the band finished 11 songs for the new record in two weeks. In April, the band announced that they have recorded 15 songs, ten of which will make the final cut. In May, Erna announced that the album is titled 1000hp (1000 Horsepower). The album's title track was released as a single the following month. The album was released on August 5, 2014 and sold around 58,000 copies in the United States in its first week of release to land at position No. 3 on The Billboard 200 chart. Since release the disc has spawned the single Something Different and What's Next. The band have unified a campaign to aid military veterans with their latest single What’s Next. Godsmack also headlined 2014 Uproar Festival. They were announced on August 20, 2014, to be part of the Soundwave Festival in Australia. It has expanded to a 2-day festival for the first time, in February/March 2015 and followed by series of shows and tours around Europe. In July 2015, The band has revealed dates for an upcoming North American fall headline tour. The run includes dates with Sevendust. Also in August 2015 Godsmack announced a new leg of North American dates that will keep the band busy through mid-November. On October 14, 2015, Godsmack released a digital single called "Inside Yourself" available for a limited free download. The song was released on iTunes on November 20, 2015. On September 9, 2016, Erna has confirmed that the band has officially left Universal/Republic, and signed a deal with BMG. Godsmack has been described as nu metal, heavy metal, post-grunge, hard rock, and alternative metal. The band's primary influences include Aerosmith, Alice in Chains, Black Sabbath, Led Zeppelin, Metallica, Pantera and Rush according to Erna, Larkin, and Rombola. Erna has cited Layne Staley as his primary influence. The overall sound of the band's first two albums sound similar to the sound of the Alice in Chains album Dirt. However, Godsmack has attempted to distance themselves from the Alice in Chains comparison with Erna stating in an interview with Matt Ashare, "I've just never really heard that in our music". The band's music is often compared to Alice in Chains which the band cites as an influence. Adrien Begrand of PopMatters states, "Erna perfectly mimics the late Layne Staley's low, guttural, sinister singing and snarly, metal-inspired growls" -Erna's vocals also seem to be reminiscent of Metallica's James Hetfield- and, "The band's music is a faithful retread of Jerry Cantrell's churning, tuned-down hard rock". Katherine Turman of Amazon.com states the band has "dark, swirling, commanding music". She also commented on the band's third album Faceless, which "mixes arena rock in the vein of an Alice in Chains", "riff-heavy, layered tunes and sharp, confident bridge-burning lyrics". Erna's singing style has been stated as "the snarl of James Hetfield", and "composed of dark harmony that sounds a lot like Alice in Chains". Merrill's bass style has been described as "bulldozer bottom with occasional slap-bass reverb". Larkin's drumming is thought to "worship at the twin altars of Neil Peart and John Bonham". And Rombola's guitar playing style has been praised as "guitars that sound like percussion instruments". ↑ "Universal Republic Rockers Godsmack Lock Down Another No. 1 Single with 'Whiskey Hangover'". Reuters. September 14, 2009. Retrieved September 14, 2009. ↑ Shanahan, Mark (August 7, 2014). "Mayor Walsh marks Godsmack Day". The Boston Globe. Retrieved August 7, 2014. 1 2 3 4 5 6 7 8 "Godsmack – Bio". Godsmack.com. Archived from the original on September 30, 2007. Retrieved October 10, 2007. ↑ Scaggs, Austin (May 6, 2003). "Sully Awakes". Rolling Stone. Retrieved December 2, 2007. ↑ Gabriella (October 1, 1999). "Sully Erna of Godsmack on Karma, Christians and the Law of Three (NY Rock)". Nyrock.com. Retrieved October 10, 2007. ↑ Seaver, Morley. "MorleyView Interview with Shannon Larkin of Godsmack". MorleyView. Retrieved December 6, 2007. ↑ "Godsmack biography – Barrystickets". barrystickets.com. Retrieved January 2, 2008. ↑ "Godsmack's Sully Erna Speaks out on drummer switch". Blabbermouth.net. August 13, 2002. Retrieved December 6, 2007. ↑ Blanford, Roxanne. "Godsmack – self-titled review". Allmusic. Retrieved November 9, 2007. 1 2 3 "Godsmack – Artist chart history". Billboard.com. Retrieved November 6, 2007. ↑ "Godsmack – News". Godsmack.com. Archived from the original on November 11, 2007. Retrieved November 6, 2007. 1 2 Ankeny, Jason (2006). "Godsmack – Biography". Allmusic. Retrieved May 7, 2008. 1 2 Schwalboski, Ann M. "Godsmack Lyrics and Biography". Musician guide. Retrieved November 10, 2007. ↑ "Rock On The Net: 44th Annual Grammy Awards – 2002". Rock on the Net. Retrieved October 10, 2007. ↑ "Godsmack – Tour 2001". Godsmack.com. Archived from the original on August 16, 2007. Retrieved November 10, 2007. ↑ "Godsmack". Mitch Schneider Organization. Retrieved May 7, 2008. ↑ Babcock, Jay (May 4, 2006). "Godsmack Frontman Gets Defensive Over Band's Alleged 'Pro-Military' Stance". Arthur Magazine. Retrieved November 10, 2007. ↑ "Talking to Godsmack (Whose Album is No. 1 on the charts) about what they use their music for.". ArthurMag.com. May 6, 2006. 1 2 Farinella, David John. "Shannon Larkin". Modern drummer.com. Retrieved November 10, 2007. ↑ "Godsmack: 'Faceless' Debut At No. 1". Blabbermouth.Net. April 16, 2003. Retrieved December 10, 2008. ↑ "Grammy Award Winners". Grammy.com. Archived from the original on December 2, 2007. Retrieved November 10, 2007. ↑ Wiederhorn, Jon (April 18, 2003). "Godsmack: Unpolished, Uncompromised". MTV. Retrieved November 10, 2007. ↑ "Metal Edge Magazine – "First great band of the millennium" – Hit the road with vengeance". Metal Edge. April 3, 2003. Retrieved November 10, 2007. ↑ Wiederhorn, Jon (June 3, 2004). "Ex-Godsmack Guitarist Finds Second Act – News Story". MTV News. Retrieved October 10, 2007. ↑ "Discography – The Other Side". Godsmack – Discography. Archived from the original on October 24, 2007. Retrieved November 10, 2007. ↑ Wiederhorn, Jon (October 8, 2003). "Godsmack Travel To The Other Side For New EP". MTV. Retrieved January 2, 2008. ↑ "Ultimate Guitar – Godsmack's acoustic album". MTV.com. October 13, 2003. Retrieved November 8, 2007. ↑ "Metallica.com". Metallica.com. Retrieved October 10, 2007. ↑ "Godsmack.com – Metallica tour". Godsmack – Tour. Archived from the original on August 25, 2007. Retrieved November 8, 2007. ↑ "Godsmack tour '07". Godsmack.com. Archived from the original on October 11, 2007. Retrieved November 8, 2007. 1 2 Fuoco, Christina (June 23, 2006). "Interview: Shannon Larkin of Godsmack". Entertainment News. Retrieved November 10, 2007. ↑ "Ugo – Bands on demand – Godsmack". Ugo. Retrieved November 10, 2007. ↑ Bowar, Chad. "A Conversation with Drummer Shannon Larkin". Heavy metal about. Retrieved November 10, 2007. ↑ Jenny, Feniak. "The music and magic of Godsmack". Edmonton Sun. Retrieved November 10, 2007. ↑ "'Livin in Sin' with Godsmack's Shannon Larkin". Live-Metal.Net. May 6, 2006. Retrieved November 10, 2007. ↑ "Godsmack – 'Good Times Bad Times' First-Week Sales Revealed". Blabbermouth.net. Retrieved December 14, 2007. 1 2 "Blabbermouth.net – Godsmack Looking Back at 'Good Times, Bad Times' In November". Blabbermouth.net. October 4, 2007. Retrieved October 10, 2007. ↑ "Godsmack Updates From Shannon". Godsmack.com. Archived from the original on March 1, 2009. Retrieved November 3, 2008. ↑ "Mötley Crüe's 'Crüe Fest 2' Lineup Officially Announced". Blabbermouth.Net. March 16, 2009. ↑ "Godsmack Working With Producer Dave Fortman On Next Album". blabbermouth.net. November 11, 2009. Retrieved February 19, 2010. ↑ "Godsmack Grabs Third No. 1 Album". Billboard.com. Retrieved May 7, 2010. ↑ "Godsmack Working On 'Really Heavy' New Album". Blabbermouth.net. May 27, 2009. ↑ "Rockstar Mayhem Festival 2011 Âť Bands". Mayhemfest.com. Retrieved July 18, 2011. ↑ "Godsmack Mixing Live Tracks For Upcoming Release". Rockaccess.net. Retrieved December 15, 2011. ↑ "Godsmack Almost Done With Covers EP". artistdirect.com. Retrieved February 15, 2012. ↑ "Godsmack Putting Finishing Touches On Covers EP". Blabbermouth.net. Retrieved February 13, 2012. ↑ "Godsmack's Cover Of Joe Walsh's 'Rocky Mountain Way' Available For Streaming". Blabbermouth.net. ↑ "Godsmack's Sully Erna Announces Dates for 2013 Solo East Coast Tour". Loudwire.com. January 15, 2013. ↑ "Sully Erna of Godsmack Announces Handful of Solo Shows". Artistdirect.com. January 18, 2013. ↑ "Godsmack: 11 Songs Written For Next Studio Album". Blabbermouth.net. February 7, 2014. ↑ "Godsmack Offer Big Updates On New Album". Loudwire.com. February 7, 2014. ↑ "NEW Godsmack Album is Finished". Godsmack.com. April 22, 2014. ↑ "Godsmack's Sully Erna Says Forthcoming '1000hp' Album Is A 'Bit More Raw'". Blabbermouth.net. May 30, 2014. ↑ "GODSMACK's '1000hp' Lands At No. 3 On BILLBOARD Chart". Blabbermouth.net. August 13, 2014. ↑ "Godsmack Unveil '1000hp' Video; Debut at No. 3 With New Album". Loudwire.com. August 13, 2014. ↑ "GODSMACK Partners With Charity HOME BASE With New Single 'What's Next?'". Blabbermouth.net. September 16, 2015. ↑ "Godsmack headlines Uproar Festival". Bradenton.com. September 18, 2014. ↑ "Godsmack Announces Tour Dates With Sevendust". Metalunderground.com. July 13, 2015. ↑ "Godsmack and Sevendust To Embark on Fall 2015 North American Tour". Loudwire.com. July 14, 2015. ↑ "Godsmack Extends North American Plans". Pollstar.com. August 18, 2015. ↑ "Godsmack to end its fall tour with a stop in Las Vegas". Los Angeles Times.com. August 19, 2015. ↑ "Godsmack Surprise Fans With Free Song 'Inside Yourself'". Loudwire.com. October 14, 2015. ↑ "GODSMACK Releases New Song 'Inside Yourself'". Blabbermouth.net. October 14, 2015. ↑ "Godsmack Offer Free Download of New Song, "Inside Yourself"". Revolvermag.com. October 14, 2015. ↑ "Godsmack Offer Free Track 'Inside Yourself'". Radio.com. October 14, 2015. ↑ "Godsmack on Facebook". Godsmack. Retrieved November 17, 2015. ↑ "Inside Yourself - Single by Godsmack on iTunes". iTunes Store. United States: Apple Inc. November 20, 2015. ↑ "GODSMACK Splits With Longtime Label REPUBLIC/UNIVERSAL, Signs With BMG". Blabbermouth.net. September 10, 2016. ↑ "Godsmack's Sully Erna Confirms Band's Label Change". Loudwire.com. September 11, 2016. ↑ Blanford, Roxanne. "Godsmack review". Allmusic. ↑ Louvau, Jim. "Desert Uprising Day 2: Staind, Godsmack, Shinedown deliver". azcentral. 1 2 Kergan, Wade. "Faceless - Godsmack". Allmusic. ↑ Heaney, Gregory. "Live & Inspired - Godsmack". Allmusic. ↑ Bradshaw, Chris. "Rock-themed cruises combine intimate concerts and a tropical getaway". Naple News. ↑ Garrity, Brian. "Godsmack Keeps Alt Metal 'Awake'". Billboard. Nielsen Business Media. 112 (44): 18. ↑ Ankeny, Jason. "Godsmack - Artist Biography". AllMusic. Retrieved 2012-10-29. ↑ Sharken, Lisa (November 20, 2000). "Exclusive: Tony Rombola of Godsmack". Gibson.com. Archived from the original on September 30, 2007. Retrieved November 10, 2007. ↑ "New Hampshire People – Sully Erna/Godsmack". New Hampshire People.com. Archived from the original on October 5, 2007. Retrieved November 9, 2007. ↑ "Subvulture.com – Godsmack". Subvulture.com. Retrieved November 8, 2007. ↑ Ashare, Matt. "Soft cell The other side of Godsmack". Portlandphoenix.com. Retrieved January 2, 2007. 1 2 Begrand, Adrien (March 16, 2006). "Godsmack – The Other Side". Popmatters.com. Retrieved November 17, 2007. 1 2 Turman, Katherine. "Editorial Reviews". Amazon.com. Retrieved November 17, 2007. ↑ Wiederhorn, Jon (October 8, 2003). "Godsmack Travel To The Other Side For New EP". MTV. Retrieved November 19, 2007. 1 2 Kot, Greg (November 9, 2000). "Godsmack Awake Album Reviews". Rolling Stone. Archived from the original on December 2, 2007. Retrieved November 19, 2007. ↑ "Godsmack – Ken Philips Publicity Group –". Kenphillipsgroup.com. Retrieved July 18, 2011. Wikimedia Commons has media related to Godsmack.